1878 Gosport, England, 306 reservist Irish men from King' s County, Queen's County and Royal Meath Militia join for duty April to July 1878. 1879 Headquarters to Birr, Ireland - 67 Brigade Depot. (Majority of the former Jäger Corps enlisted men leave the Regiment. 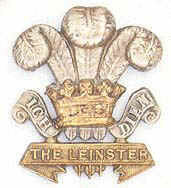 1881 July 1st 109th (Bombay) Infantry renamed 2nd Battalion The Prince of Wales's Leinster Regiment (Royal Canadians).